It says “Roaster Fries” but that’s not what they really are. It says "Roaster Fries" but that’s not what they really are., originally uploaded by !!! :: jozjozjoz :: !!!. Do you know what they are?! They look like kidneys to me…but why would someone eat that many kidneys? Either it’s kidney, or it’s balls. Ditto. And is that a piece of fat trailing off from the “sausage” or a ureter? my guess would be testicles! yummy….?!? Yeah, they are “Rooster Fries” == rooster testicles. The ones from cows are called “Calf Fries”. I think they mean rooster fries which are rooster gonads. And that is what that looks like in the picture. They are supposed to be a tasty snack when fried and in some Asian and southern U.S. cultures are considered a delicacy. I am not going to even consider trying it. Grams made this all the time when I was a kid because I LOVED them. Yes, they be cluckin’ gonads, but I don’t care. Fried “rooster nuts” were a bonus at our ole family reunions. Nothing fancy, just good eating. Along with fried okra, and barbequed goat (stew meat). Or, even, some cillie made with a pound of ground goat (kid), a pound of ground deer, & a pound of ground lamb. If you love them cheapie burgers you buy at the (alledged) cut-rate store (Save-A-Lot, Walmart, Buy-Rite, Buy-Low, Aldi’s, Pigly Wigly, ect…)… then DO-NOT read the ingredients lable!!! Or Rooster Testicules, may sound a whole lot better to you. 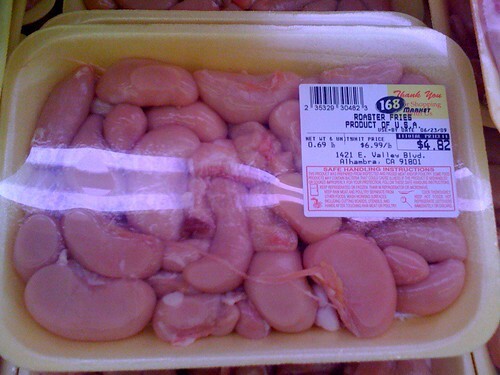 Are there any retail sources for Rooster-testicles in the southern IL/IN areas? If so, I honestly would like to know of them. Our local chicken processing plant closed many years ago, and have no store to get them at. Thanks for any honest, non-smart-a**, responces, that are helpfull. They are rooster fries. they are delish. Where did you find these? do they ship?